Argentina’s navy has said there is still no sign of a submarine that disappeared nine days ago. Although an event “consistent with an explosion” was detected north of the ARA San Juan’s last-known location, spokesman Captain Enrique Baldi said there had been no more trace of it. More than 12 countries have offered to help with a search mission for the vessel, which had 44 people on board. Mr Baldi said the search would continue, and teams had access to “the best technology available” via the US navy. “We have the best naval, air and sensor resources available in the area, all focused on searching for the submarine. Some of their relatives reacted with anger to the news on Thursday that an explosion had been detected. “They manipulated us! 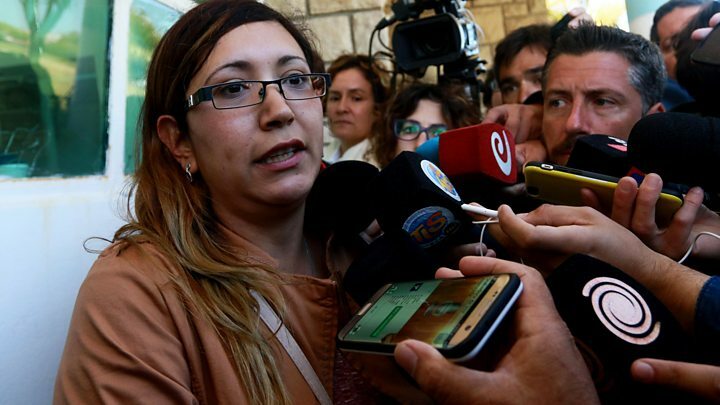 They lied to us!” said Itatí Leguizamón, whose husband was on board. Who are the missing crew? She and others have raised questions about the state of repair the submarine was in. Some said lack of investment and corruption in the armed forces had made the submarine unsafe. Argentine newspaper La Nación reports that President Mauricio Macri is planning to visit the heads of the armed services. There is also speculation that navy chief Marcelo Eduardo Hipólito Srur may resign, but officials have said this is not imminent. On Wednesday the navy received a US report of a loud noise – called a “hydro-acoustic anomaly” – detected hours after the submarine went missing. The navy knew only the location of the suspected explosion, not its cause, Captain Baldi said, and search efforts would be concentrated in the area. What was the sub’s last known location? The ARA San Juan was returning from a routine mission to Ushuaia, near the southernmost tip of South America, when it reported an “electrical breakdown”. According to naval commander Gabriel Galeazzi, the submarine surfaced and reported the breakdown, which Capt Galeazzi described as a “short circuit” in the sub’s batteries. According to Capt Balbi, the captain of the ARA San Juan contacted the naval base once more after reporting the problem. In the message, he reportedly said that the problem had been adequately fixed and that the sub would submerge and proceed towards Mar del Plata. The last contact was made at 07:30 local time (10:30 GMT) on Wednesday 15 November. It is not known what happened to the sub after that contact. Argentine navy protocol stipulates that in peace time, submarines make contact with the base twice a day. When the submarine failed to call in, the Argentine navy began its search. There are 44 crew on board the submarine, which is under the command of Pedro Martín Fernández. Forty-three of the crew are men but there is also one woman, Eliana María Krawczyk. The 35-year-old is the first female officer in Argentina to serve on a submarine. Nicknamed “the queen of the sea” by her father, she comes from Oberá, a city in northern Argentina. Despite having been born and raised far inland, her relatives say that “she was born to be a submariner”, citing her “will of steel” and a passion for her job. The rest of the crew is made up of submariners of varying ages and experience. The sub’s engineer, Hernán Rodríguez, has been on the ARA San Juan for 11 years, local media reported. How could the missing submarine be found? Brazil, Chile, Colombia, France, Germany, Russia, Peru, South Africa, Uruguay and the UK are among the countries that have sent either ships or planes to help with the search. The US navy has deployed two underwater vehicles which use sonar to create images of the sea floor. A Nasa research aircraft has also flown over the search area but failed to spot anything.